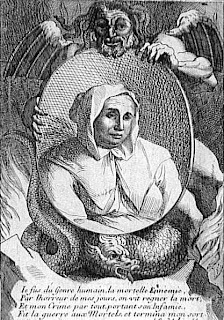 As an independent, sexually elusive 35 year old with flowing robes, suspicious herbal garden, dilapidated residence and proclivity for drinking large amounts of alcohol, Catherine Monvoison, named “la Voisin”, was the 17th century poster child for evil sorceress. Yet, despite her unflattering engraving (shown here) la Voisin was not some badly dressed charlatan scaring the local kids. She was the chief witch to the most influential members of Louis XIV’s court. Members of the nobility would find themselves at la Voisin’s doorsteps for several reasons. She dabbled in the usual witch fare; tarot card reading, séances, horoscopes, abortions, palm reading, chiromancy, beauty potions, and an occasional aphrodisiac to make a reluctant lover fall hopelessly in love. When M. de Prade sought a marriage with the wealthy Madame Laferon, la Voisin buried a wax figure of de Prade in Madame Leferon’s garden. * Another recommended love spells was to bury menstrual blood. To get rid of an unwanted husband, la Voisin recommended obtaining some of his urine and discarded eggshells from the eggs he had eaten. If urine didn’t work then you better find yourself some pigeon or sheep’s hearts, mummy powder, iron filling, or a mole's teeth to work into a spell. La Voisin's popularity as chief purveyor of potions and spells to the nobility soon earned her the moniker ‘a duchess among witches’, but also fate a less desirable than Psychic to the Stars. On March 1679, la Voisin was arrested on charges of witchcraft. A witch-hunt soon followed with over 400 people implicated in what became known as ‘The Affair of the Poisins.’ La Voisin’s daughter Marie started to talk and favored courtiers with a dangerously close proximity to the king were accused of practicing witchcraft. Some of these names even included Louis’ mistress, Francois-Athenais de Rochechouart, Madame de Montespan and his old crush, Olympe Mancini, comtesse de Soissons. The accusations stemmed from La Voisin’s less innocuous repertoire involving poisons and love spells using dead body parts and celebrating Black Masses with sacrificial babies. 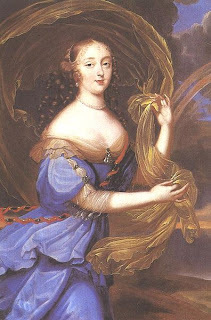 Supposedly, Madame de Montespan paid a visit to la Voisin when she wanted to usurp her rival for the king’s affections, Louise de la Valliere. La Voisin recommended that Madame de Montespan sneak dead baby’s blood, bones, and intestines with a dab of toad and bat parts into Louis’ meat. Yum! But whether deserved or not, la Voisin is not remembered for harmless beauty potions and aphrodisiacs, but as one of history's great poisoners and raucous trouble makers.The Poison Affair ended with over 34 people executed and several courtiers banished from court. (Olympe Mancini fled in fear for her safety. ) A year after her arrest, la Voisin was burnt to death at the Place de Greve in Paris. *History doesn’t tells us if these spells worked, but think carefully before you sneak into your neighbor’s garden with a wax doll. **Get your mind out of the gutter. Spanish fly was used as a blistering agent to heal George’s throat infection. Somerset, Anne. The Affair of the Poisons: Murder, Infanticide, and Satanism at the Court of Louis XIV, New York, NY: St. Martin's Press, 2004. Fraser, Antonia. Love and Louis XIV: The Women in the Life of the Sun King. New York, NY: Nan A. Talese, 2006. Great post! I'll have to search out the Anne Somerset book. My question is, though, where exactly did one find mole's teeth and bat's blood and the like?? Did they actually go out and kill some moles and bats or was there somewhere special they went to obtain these things? Or did La Voisin already have a supply on hand? Susan - Anne Somerset's book is great. She is one of my favorite authors and I especially loved her book on "Ladies in Waiting." Katie - That's a great question. La Voisin did obtain most of the ingredients for her potions herself, but for the tougher ones (catching a bat can’t be easy) she probably just stopped at her local apothecary. Mole parts and bat’s blood was common fair for the 17th century apothecary. They made most of their money from selling more exotic ingredients and prints of 17th century apothecaries always have a token bat hanging from the ceiling. (Bat’s blood was believed to help eye sight. The logic is silly – a bat could see well so its blood must help eye sight.) And in the previous post, I mentioned a mole’s foot being used to ward off illness. I don’t remember reading about the medicinal powers of mole’s teeth but people tended to use ALL parts of the animal for cooking and medicine so it would have been fairly easy to get some mole’s teeth at your local apothecary if you couldn’t catch one on your own. I also have a previous post on iron filling being commonly used to cure "green sickness". What is really sick to think about is how she got the babies blood (if that is true). Lucy and Katie - Yes, I agree that Montespan certainly was no saint. She is not very likeable at times either. I do think that she could have used some pretty sick aphrodisiacs but engaging in a black mass was in a league of its own. Extreme piety/decadent life style? Methinks she could have gotten some of the creepier ingredients. OTOH, that quote of committing one sin not including them all could hold true. The Archives of the Bastille, preserved in the Bibliotheque Nationale de France, contain the sworn testimony (obtained by much more lively means than we have access to today outside of Guantanamo) of the actors in L'Affaire des Poisons. There is abundant evidence that small children were killed and their blood and organs used during Black Masses organized by La Voisin and conducted by Abbé Guibourg on behalf of the Marquise de Montespan. Whatever else she was or was not guilty of, Catherine Deshayes Monvoisin earned her gibbet and her fire. Silly twits, what you tell your customer and what the product actually is were two different things. La Voisin was a business woman first and she wasn't running around chasing bats--I can guarantee that. It gives a whole new perspective on the Old Witch Tales about La Voisin. BTW: That engraving was done just before she was executed. You would look so great either if you'd been in prison for a year.